Making sweet honey-flavored jelly is as easy as picking a few weeds and cooking up the yellow blossoms…into Dandelion Jelly. Yes, really! This recipe was originally published in 2014 – and has become our most popular recipe. I’ve updated the post with new photos and retested the recipe to make certain it comes out just right. Please try it! Fun: The funnest (I know it’s not a word) recipe I’ve ever made! Green thumb not needed: Even urban dwellers can find dandelions growing…somewhere. Try our foraging: No fear that you might get a deadly dose of a poisonous plant. Dandelions are easy to identify. Farm to table: Taking a product from farm (or lawn) to table is rewarding to do with your kids. Surprisingly easy: Almost as easy as finding dandelions. Sweet honey flavor: This Dandelion Jelly tastes EXACTLY like honey. After all, bees take nectar from dandelions to make honey – in this recipe, you just steep nectar-rich petal, add sugar, a little lemon and you’ve got Dandelion Jelly. Have you ever foraged for your food? What about dandelion greens – might you eat them in a salad? I ate these above – when small and tender they have only a slightly bitter bite. Mmm I’m going to have to try this! Let me know how it turns out Gemma! It really is a sweet, slightly floral taste …like nothing else – but honey! Bravery doesn’t have a lot to do with it…it’s more like I have too many cookbooks! How fun is this?! Love it! I never knew you could make dandelion jelly, but I have made dandelion greens pizza before 🙂 This would definitely be a fun project to do with the kids. Have fun with your garden!!! Thanks EA! One thing I didn’t put in the post was how excited my daughters’ dandelion ‘harvesting’ friends were to try the jelly…they were jump-up-and-down excited. What a fun and neat idea! Today I learned that “dandelions are more nutritious than broccoli or spinach” – wow! Shashi recently posted..Healthy Chocolate Scones! Headed over to check out your Chocolate Scones…Hello! i’m totally fascinated! 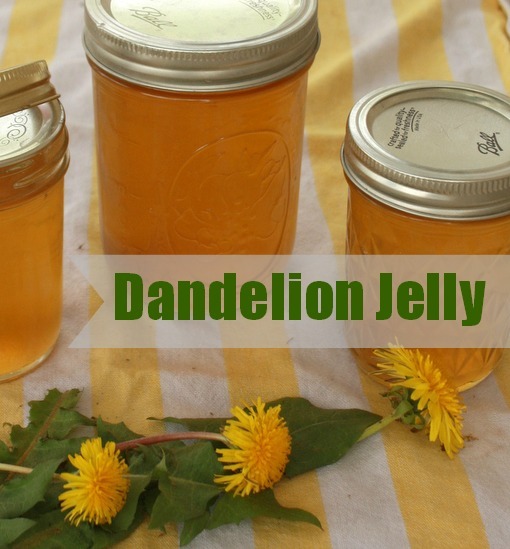 i love making jelly but would have never thought of dandelions…. i wonder what other “weeds” would make a nice jelly!!? Gretchen, try using wild violets! So very sweet and yummy! I just made some from redbuds, it’s very tasty and a beautiful color! Thanks for your recipe!! Jodie that is SUCH a great idea. Now I have to try that too! Thanks so much for taking the time to let me know. It totally makes my day! Quick question: For the second round of petals, are you re-boiling and re-using the original steeping water? Or are you using more, fresh water and making another batch of the dandelion-steeped water?? Lee- For the second round, use the same dandelion-steeped water from the first batch of petals. You want to concentrate as much flavor as possible! Let me know if you make it and how it turns out!! We’re still waiting for dandelions to pop up this year…then will be making another batch! Made this last year, and in the process of making it again! LOVE IT!! Thanks for letting me know Kirstin! 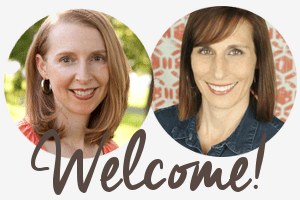 (And for disclosure – you are no relation to me! 🙂 We have no dandelions yet here – but I’ll be making as soon as they pop up! So, this was different than the recipe I used last year. This is way more bitter than what I was expecting. I assume it’s from the extended steeping of the petals. It’s good jelly, but I prefer to have mine sweeter. Thanks for the feedback Kirstin! I’ll bet your flowers may have been more mature than mine? I used very new blossoms. That’s a good reminder for me this year – when I make it. If my blossoms are older, I’ll do the straining only once. To sweeten your jelly now, you can always mix in a bit of honey when serving. I’ve never heard of dandelion jelly before – this is such a creative recipe! Dandelion jelly! I NEVER thought about this. This jelly would give you the health benefits of dandelions as well as a nice tasty spring-time meal. I will be cooking this up, as well as sharing it out to my readers, thank-you so much! Thanks for taking the time to comment Kevin! And i’ll be checking out your post for how to store dandelions. I’ve frozen the blossoms til I have enough to make the jelly…but maybe you have another idea! My first batch didn’t thicken even though I followed the instructions as printed. Second batch used my normal way( Bluebook) and it thickened nicely. Am recooking first batch to see what happens. Will make another batch using the Bluebook method. Tastes like the honey you said it would. Thanks! Thanks so much for letting me know Anna. It is a fickle recipe, Anna. I made it again last week and it got to the thickness of honey – which is what it tastes like – so it was rather fitting. What steps did you do differently to get it to make it thicken? I’d love to know! Instead of adding all the ingredients at one time, I added the sugar last and then cooked for one minute. Wow! This is definitely the most unique recipe I’ve seen in a while. Love the idea of making something with ingredients you’ve foraged youself. I didn’t know that dandelion is edible! This is an enlightening post, Serena! I will definitely give this jelly a try! Agness of Run Agness Run recently posted..‘Barefoot Running’ – Silly Craze or the Future of Running? Thanks so much for stopping by Agness! I would love to hear about your Dandelion Jelly results when you get a chance. Thank you for the wonderful recipe. I am however surprised at your recommendation to use yellow food colouring???? Yellow food colouring is the worst, especially for children. You should ssseriously take a look at this. Saffron will also add a nice tint without the bad side effects. I will supplement the sugar with unrefined coconut sugar so the colour will be more brown anyway. Thanks for visiting Brigitta. The yellow food coloring is totally optional. And I figure one drop (and really that is all I needed for the entire batch of 5 jars!) is totally fine for my kids. But I do really love your idea of using saffron! Next time I’ll try that. I will try adding the saffron when I steep the second batch of dandelion petals. I’ll bet it will add a bit of earthy flavor and I’m afraid it might cover a bit of the lovely floral nectar flavor – and I may need to add a bit more sugar. But it would be fun to try. Hi thanks for sharing this recipe! What kind of tricks can you use/do to get the recipe to thicken? Mine didn’t thicken at all 🙁 I followed exactly what it said. I’d like to open the jars back up and try to fix it but I’m not sure how! I’m so sorry it wasn’t what you were expecting Tiffany. But I greatly appreciate you letting me know – I always want my recipes to be even better than expected – especially when you went to the work of picking all those dandelions! I mention in the Recipe Notes that for a thicker consistency, use 4 1/2 cups sugar. But if you want to reprocess your current batch, you should be able to add 1 cup more of sugar and bring to a boil, then boil 1-2 minutes. Let me know how it turns out! The problem some people had with getting the jelly to gel (thicken) almost certainly has to do with adding the pectin. It is CRUCIAL that the pectin be SLOWLY mixed into warm (not boiling!) liquid until fully dissolved, brought to a full boil (briefly), THEN you add the sugar. Adding the sugar and pectin at the same time does not allow for the pectin to hydrate, negating its effects. If in doubt, just read the general directions on the pectin box or package. Totally going to try this. Thanks you for sharing! You are very welcome Serena! Please note that my advice above about the proper point to add your pectin only pertains to the use of reduced-sugar pectins. If you are using the traditional (high sugar) pectin, or liquid pectin, then you should follow the advice given on the packages of those particular pectins. Also, be aware that when using reduced-sugar pectins, if you batch does not turn out properly gelled, there is no way to “re-work” the jelly by adding more pectin and recooking it — once you add the full amount of sugar, there is no going back, and no way to salvage the batch. That is just inherent in the chemistry of these kind of pectins. Thank you. This is very interesting and helpful. It is absolutely wonderful 🙂 I love it !! Well the important thing is: how did it taste Patty?! You did nothing wrong! (: As I mentioned in the ‘Ingredients’ list, the jelly is more green-hued; to make it more yellow, it really needs that 1 drop of yellow food coloring mentioned in ‘Ingredients’. I was hesitant at first, but now i’m a believer. I don’t know if it going to set up to jelly or not, but it’s delicious!! !if i don’t stop “taste-testing” the one I am leaving out, it will be empty before i know if it turns to jelly!! Thank you! Oh! Thanks so much for letting me know Cloie. It totally makes my day. Isn’t fun how much it tastes like honey?! Can this be frozen to keep for longer time? This is fabulous!!! Tastes just like honey with a touch of lemon. I used regular pectin. I used a candy thermometer and let it reach 225 degrees, boiled 1 minute. Thinner than regular jelly, but hubby loves it ,puts it in his oatmeal. I also made this recipe using some organic mint tea i needed to use up and it turned out fabulous as well.still thin. But thanks Alan, i now know what i must do. Thanks so much for taking the time to let me know Paula! That’s a great idea to make mint tea jelly! Do you know if this can be frozen for longer storage? Yes! The jelly can absolutely be frozen. I’ve frozen in the jelly jars – just make certain there is enough headspace (room at the top of the jar) for the jelly to expand with freezing. Leave about 3/4-inch headspace. Thanks for visiting Alex!